You may or may not have noticed but our society has developed some pretty definite ideas where things such as play, exercise, industry or even work should happen. For a variety of reasons, over time we’ve built up infrastructures that reinforce where, when and how these things should happen. This has manifested itself in the densest of zoning regulations, a sea of signage, a chokehold of streets and even a collection of singular places of play, and recreation. In most cases we originally did these things with the best of intentions- safety and efficiency to name a few- but for the most part, this landscape of regulation simply isn’t working anymore. Minus interstates, car-centric roads simply don’t meet the social, ecological and transportation needs of our cities. Constraining activity in public parks and squares to singular, pedestrian pursuits leads to dead, and vacant spaces. Limiting play to playgrounds often makes our children entirely dependent on adults and in turn fat due to relative inactivity. I could go on and on but suffice it to say that, Houston, we have a problem. The real challenge is that in addition to the massive physical and legal infrastructure we’ve built, our cultural attitudes have developed in a similar fashion. Taking down signs, changing a street or adjusting a law is relatively easy if the public will is there but quite often this will or culture is the harder nut to crack. And when we’re talking about public planning processes, this can lead to a huge amount of rancor and the missing of great opportunities to do something truly appropriate for the challenge at hand. 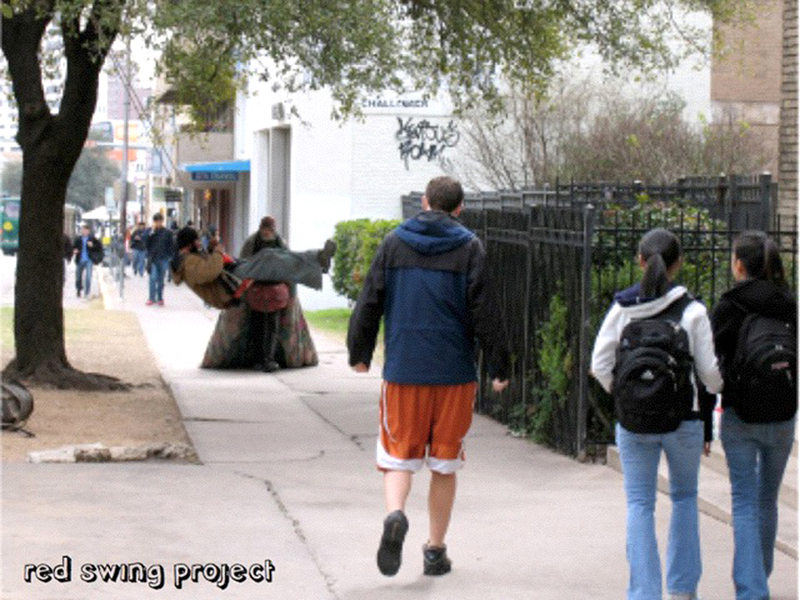 How do we change a culture of use or public space? One of our favorite tools for doing this was created by a good friend of ours, Andrew Danziger. 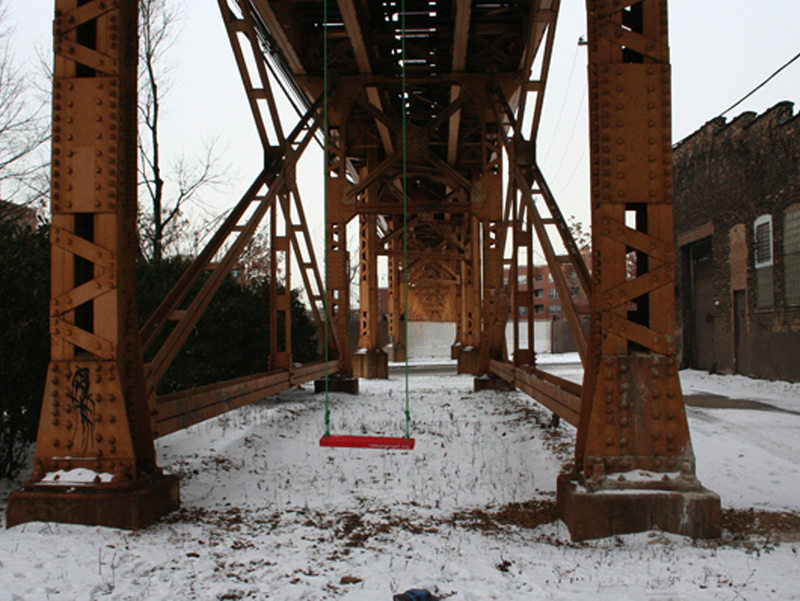 Andrew’s ingeniously simple Red Swing Project (here), embraces the ideas of individual initiative, joy and the temporary to challenge people’s perceptions of where play happens or how we generally use our city. Get some rope donated from a climbing company, reclaim a 2 x 6, find some red paint, install your swing in an ‘challenging’ place, test it out and photograph people giddily using it. Sometimes they get cut down, other times they linger and every once in awhile, such as when Andrew installed one at the De Menil in Houston without permission, they are fully embraced and become a star attraction. 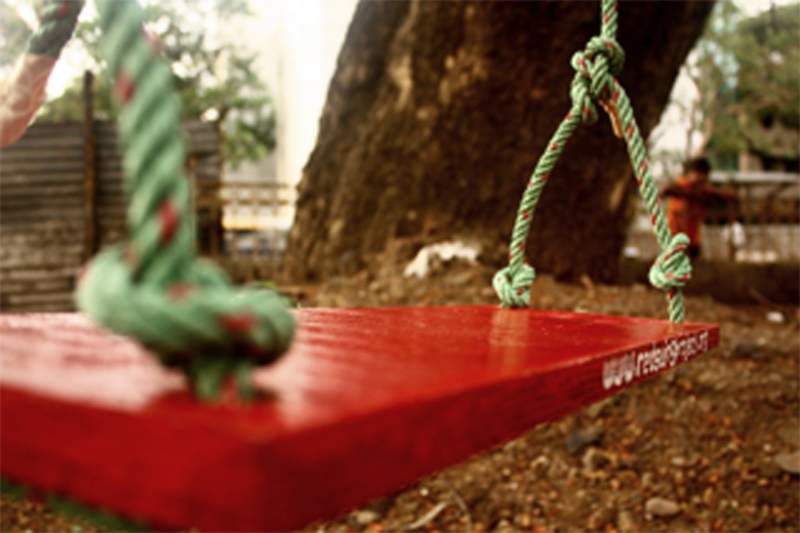 The best thing about the Red Swing Project is that anybody can do it. If you were here right now, we could set one up over lunch. Interested? That’s right, you can change your city. Andrew collaborated with us on Waller Creek Is For Lovers (here), installing a swing over the neglected Creek and the reaction was amazing. It drew people down into the under-loved space who had never before ventured into the Creek, it charmed local politicians……..it showed someone cared. And believe it or not- despite all of the rules and regulations that dictate it should be immediately cut down- seven months later, it’s still there. Check out Andrew’s site (here), send him a congratulatory letter for such a smart, simple project. Hang your own swing, send him a picture and he will post it on his website.